Members of the 22nd Special Air Service (22 SAS) Special Projects team will be deployed to a specially-constucted London base, poised to carry out counter terrorism operations during the upcoming 2012 Olympic Games, it was revealed today. Authorities fear a Mumba-style terrorist attack, with teams of gunmen attacking the Olympic events or associated tourism sites. The Sun newspaper reports that the SAS will be secreted in a base on the River Thames. Equipped with Rigid Inflatable Boats, the SAS will be able to use the extensive water ways that run around the Olympic venues to move quickly to the scene of any incident, avoiding traffic jams on the roads. Additional special forces assets will be on standby to be flown into action by helicopters, which would also provide airborne surveillance for any special forces operations on the ground. The SAS deployment is part of an unprecedented security operation to protect the Games. The SAS have practised a number of drills in preparation for the Games, including a live fire exercise at the Olympic Village. 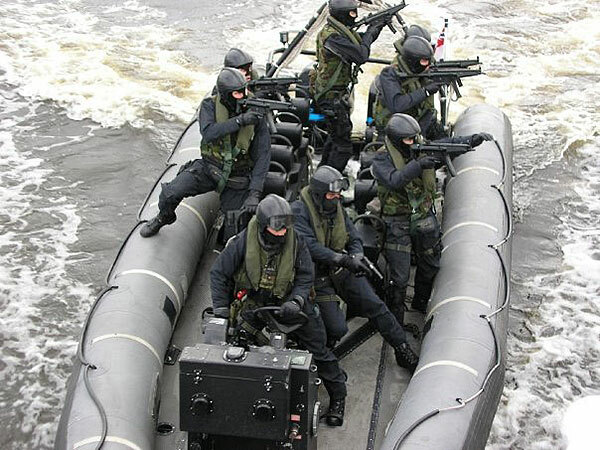 It was also reported in July that the Special Boat Service will be deployed off the coast of Weymouth in order to protect against any terrorist attack against Olympic sailing events. The Met's armed police unit, CO19, will also be on hand to provide additional security at London venues. The SAS will reportedly make use of Rigid Inflatable Boats (RIBS) such as the Arctic series of diesel-powered boats used by the SBS (pictured) and by SAS Boat Troopa.